From heart wrenching to heartwarming, Gracey’s story an inspiration - The Resident Community News Group, Inc. | The Resident Community News Group, Inc. Readers may recall the heart wrenching story about Avondale resident Gracey Smith, who was diagnosed with Type D acute lymphoma leukemia at age 14 and immediately underwent aggressive twice-a-week chemotherapy treatments and then radiation. On Feb. 12 Gracey, now 15 years old, received a stem cell transplant. Test results today show that the stem cell transplant is 100% successful and Gracey Smith is cancer free. But the journey’s been long and hard. Gracey’s mother, Michelle, shared some of what her daughter’s been going through. Gracey underwent 128 days of high dose chemotherapy, resulting in a chemo allergic reaction; 14 days of full body radiations twice a day; three surgeries, 19 spinal taps, 10 bone marrow aspirations, a double stem cell transplant; lung complication in ICU for four days, . 40 blood transfusions and about 42 platelet transfusions, reported Smith. “She lost 30 pounds when diagnosed and lost 20 pounds while in the hospital for 32 days for the transplant. She had 28 days of vomiting because she was so sick,” Smith continued. Then Gracey contracted a bladder virus and graft vs. host issues after transplant. The many side effects require physical, occupational and speech therapies. Throughout the ordeal, Gracey yearned for one thing. A puppy. Thanks to Dreams Come True of Jacksonville, Inc. and the Jacksonville Bar Association’s Young Lawyers, who sponsored her Puppy Dream, Gracey’s road to recovery is a little easier. 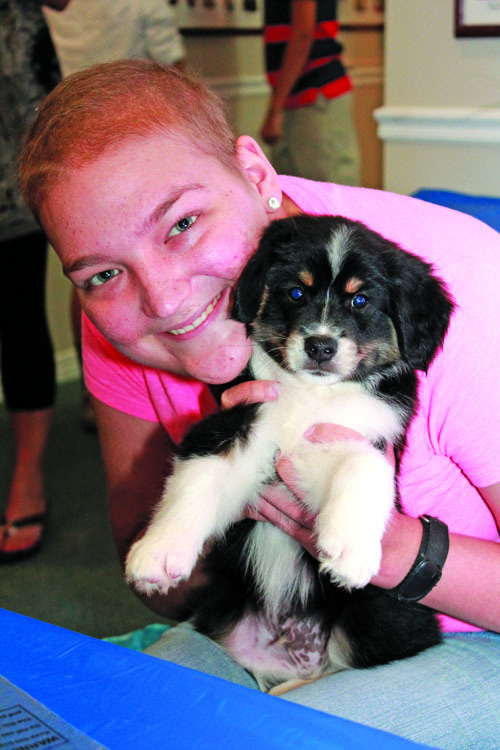 “This puppy will help motivate me and help me in my physical therapies,” said Gracey. According to Andrea A. Siracusa, Community Relations Manager for Dreams Come True, the eight-week-old puppy, a mini Australian Shepherd named Maverick, came from Rusilen Oaks Farm. Gracey was presented with Maverick on July 30 at a party, complete with surprises. “We were thrilled to give Gracey a gift card to a local pet store so she can buy toys and other items that she wants for her puppy. We were able to get dog classes donated too,” said Siracusa. Other gifts included $500 from Dreams Come True to help with the dog’s first vet visit, food and all the accessories she would like to get, plus a bag of toys and extra doggie gifts, like a dog bed. Bark, in Five Points donated a $25 gift certificate, doggie blanket and a LeanLix treat and Dog Wood Park gave Gracey and Maverick a one-year membership to the park. The Resident News also gave a gift basket in honor of Dr. Vincent Kerr, a longtime Riverside veterinarian and father of publisher Pamela Bradford Williams. Maverick will be to Gracey what the brave young girl is to others. “Gracey is an inspiration to many around her,” said her mother. “She brightens up any room that she walks into, even on her bad days. She gives hope to others.